Roberto Bolaño, Chile’s own prodigal poet has been getting an expansive amount of respect since his novels began being translated into English over a year ago. 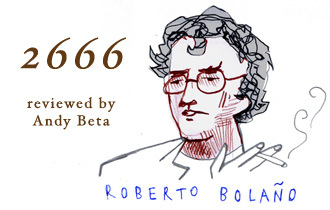 Bolaño, the longtime junky and self-affirmed outsider, passed away from liver failure in 2003; but we now fortunately have the translation of his last great unfinished novel, 2666, a sprawling, beefy, gruesome and enigmatic hunk of prognostication for where mankind may soon be headed. Best read of 2008? You decide. Review by Andy Beta. 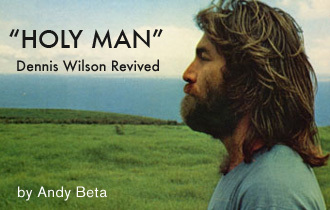 It’s been about 25 years since Beach Boys member Dennis Wilson drowned in the waters of the Pacific – the muse for his masterful one solo record Pacific Ocean Blue. But Wilson, had he lived, had much more on the way, such as the legendary unfinished Bambu, now offered along with POB as a Sony double cd. Also now available is the Criterion DVD version of Two-Lane Blacktop, a classic road race movie which stars Wilson, James Taylor (yes the James Taylor) and Warren Oates in one of his most bizarre characterizations on film (which, as Andy Beta writes, "is really saying something.") Under the shadow of elder bro Brian critically for years, the young lost Dennis is finally getting his due. Is a work of art the sum of its whole? Or a collaborative event between people and subjects – when is one bestowed the honor of creator? This question gets especially blurry when talking about the arts of film and architecture, with so many coming together to make a final product. Architect Antonio Gaudi believed he answered to one master – God. 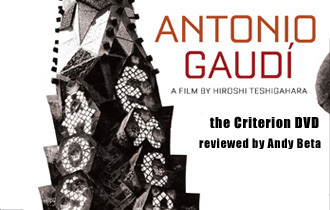 In Japanese filmmaker Hiroshi Teshigahara’s movie about Gaudi, now on Criterion DVD, we’re left to ponder questions about the notion of the autuer, as in the end it’s one of Teshigahara’s collaborators whose brilliance shines over both subject and author. Andy Beta reviews the DVD Antonio Gaudi (1984). "Time present and time past/Are both perhaps present in time future," wrote T.S. Eliot. 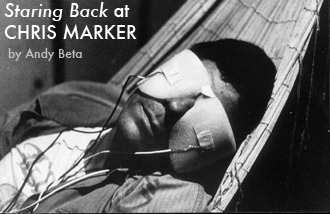 No filmmaker has absorbed this vertiginous lesson better than cult documentarist Chris Marker. Apropos of the long-awaited DVD release of two Marker classics, and a new book of his photographs, Andy Beta explores intertextual connections that reach across decades.